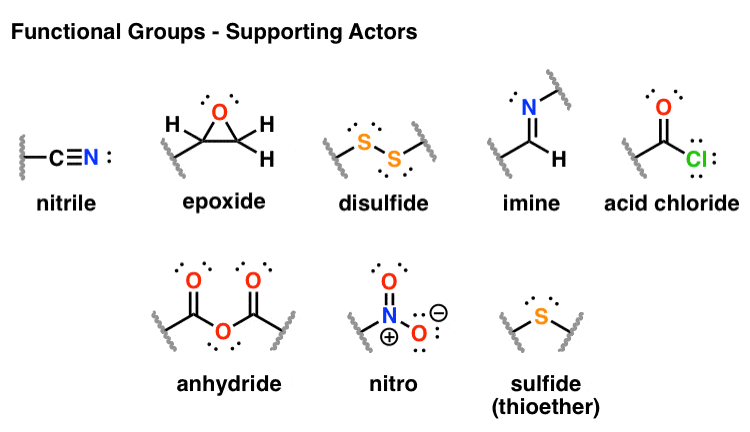 Functional groups are specific groupings of atoms within molecules that have their own characteristic properties, regardless of the other atoms present in a molecule. Common examples are alcohols, amines, carboxylic acids, ketones, and ethers. in each, what are the most and least electronegative atoms present? Which functional groups will be capable of hydrogen bonding? Which functional groups will be capable of dipole-dipole interactions? The more polar the molecule, the stronger the intermolecular interactions and the higher the boiling point. 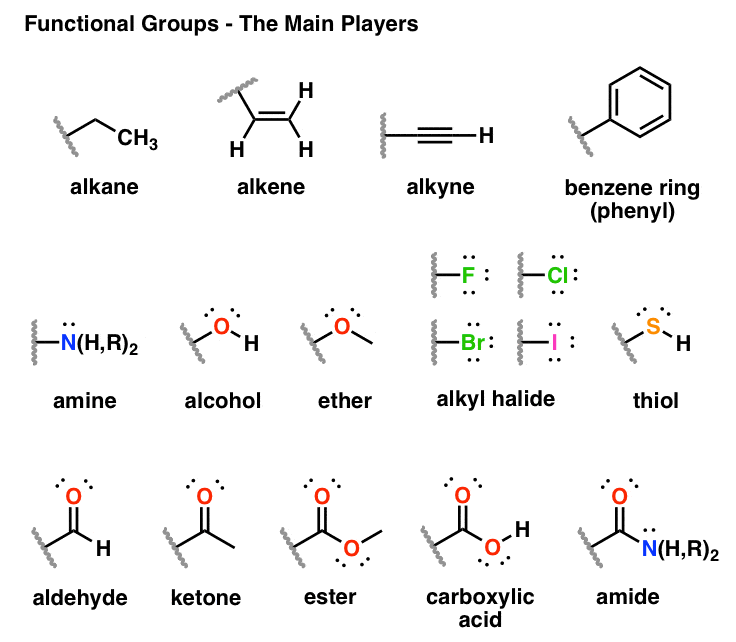 Which of these functional groups will tend to lead to the greatest increase in boiling points? The more polar the molecule, the higher the water solubility. Which of these groups will tend to increase water solubility? Decrease water solubility? If you find that you’re having a hard time recalling the structures of the functional groups, I put together a quiz [flashcards on memorize.com] that might be useful. so how will I name it? and in what order will I number the carbons acc to IUPAC? I will be highly grateful. Are you sure about the positions of Br and NO2 in this compound you have described. As it is a ether group, the functional group will be at the 5 position. Functional groups are named in alpha order if equivalent positions (3 or 5). Therefore 3-bromo, 5-nitro methoxybenzene or, since anisole IS recognized, 3-bromo, 5-nitro anisole. This entire website is an amazing resource for MCAT studying. I’m surprised you don’t have a book deal yet. thank you thank you thank you! Can you tell me whether I have permission to do this, or how I can obtain permission? Hi, I’m a bit stuck. I need to find out the boiling points of pentanoic acid and 2-hexanone which I’ve already done, and compared both to find that pentanoic acid has the higher boiling point. I then need to give some sort of example and then justify this but i am not sure how to do so, could you please help? I would move thiols to the second list, and move epoxides, imines, and acid chlorides to the first list. The latter two become incredibly relevant when discussing carbonyl addition/elimination reactions and enamine chemistry.